Flower Mound WEST Texas Fit Chicks: CHICK TRANSFORMATION! We are so proud to share this Texas Fit Chick and her transformation! Sally has put in the hard work at Flower Mound WEST Texas Fit Chicks and we are so proud of her!! Keep up the fantastic work Sally you are amazing & an inspiration to many! 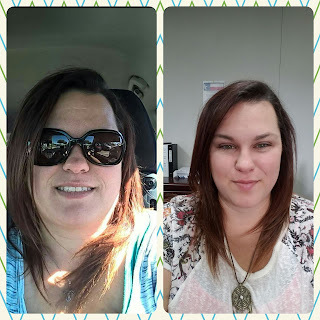 Another Chick Transformation from Joshua Texas Fit Chicks!!! I haven't been over weight all my life, I was very active when I was in high school playing sports. After that I fell out of working out and being active and just focused more on having fun than anything. When my husband and I moved to Joshua and our neighbor Hollie was a trainer and kept talking about Texas Fit Chicks I got really excited about getting healthy and working out. When she told me that she was starting a camp I was so ready to sign up and become a new and improved me! She is an amazing person and a great motivator. She has helped me decide what kind of vitamins my body needed since I was working out and the right foods to eat. I eat so much more healthier now than I have in years. Now, I am down 20 or so pounds and couldn't be happier. I can now do a burpee and I never tell her this but I do like them, I can do a real plank longer than 30 seconds, do a real push up and so much more! Thank you Hollie Walsh and Texas Fit Chicks for changing my life! Joshua Texas Fit Chicks: Chick Transformation!! I’ve been overweight most of my life. On occasion, I would lose using a fad diet, but the weight came back, and then some. Excuse after excuse were no longer an option when, in January of 2014, I retired. To what do I owe my success? Pray. Pray daily for the strength to continue weight loss successes and to be an encouragement to others. Being an encouragement to others is another critical source of inspiration. Keep a food journal. I use the “LoseIt” app, but there are other options and simple paper works well. The key is to record every morsel you put in your mouth. When I go to a birthday party, I eat cake! As you progress with journaling, begin to analyze the quality of your food choices. Move! Start small. I started walking outside 2-3 times per week for 30 minutes. Bad weather cannot be an excuse. I joined the YMCA and began to increase the amount and number of times per week I exercised. Over time, my expectation grew to engage in rigorous physical activity each day. Coming close to this goal is satisfactory. Social connections are KEY to success. I found Joshua Texas Fit Chicks when I needed it most. Honestly, I hid my self-consciousness when I first attended, but I did what I was able. Hollie Rae is absolutely the most supportive, encouraging, driven trainer with whom I’ve worked. She modifies all work-outs and has a 6th sense in regard to the progress of each individual, knowing inherently what each of us needs. When the 1st fitness test was announced, I wanted to crawl under a rock. I could not do one sit-up, couldn’t plank, and couldn’t do real push-ups. Even so, the camaraderie among the group is amazing. Everyone is accepted, encouraged, and the feeling is amazing. The private Facebook page is a source of support, recipes, encouragement, and deep friendships. The best part? In a short time with Joshua Fit Chicks, I am able to perform sit-ups, plank for 90 seconds, complete push-ups, wall sit for 3 minutes, and the list goes on. I am stronger than I've ever been. Accept that you will have set backs. Simple, but difficult to accept. On a cruise, I gained 7 pounds. When I returned, I got right back on my plan. My sweet Daddy passed away, I gained weight. Stress is the devil. I stuck to my plan and eventually, with determination, outlasted the gains and began to lose again. My most recent challenge is shoulder surgery. The recovery process is brutal and long term. I am struggling more than I ever have with journaling my food, the food choices I make, with accepting I cannot exercise and must rest to let my body heal. But, I will return to being “in the weight loss zone”. Take a shower or bath first, this is ONLY a soak. Run a tub of water as hot as you can stand (to your tolerance only). Place ingredients into water and SOAK for at least 20 minutes. This has an analgesic effect and will reduce soreness and aches.